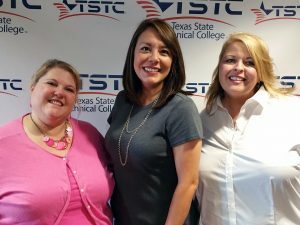 (ABILENE) – Texas State Technical College has announced the recipients of this year’s Chancellor’s Excellence Award, and seven West Texas employees were honored. Of the seven, three employees from Abilene received the award. This year’s Abilene award winners are Holle England, professional development officer; Jeannette Gist, director of student recruitment; and Jennifer Ryan, success coach. England, a 22-year TSTC employee, was honored to receive the award. Ryan has worked at TSTC for 14 years and said winning the award was a humbling experience. The “underdogs” keep her motivated at TSTC. With a background in children’s and family ministry, Gist also wanted to help make a difference for families. She enjoys helping these students take the next step toward success. TSTC touts itself as “a great place to work” and is currently hiring for over 90 positions at its 10 campuses. For information on open positions at TSTC, visit tstc.edu/about/employment. This entry was posted in Abilene on July 25, 2017 by Debra Gonzalez.